After struggling in qualifying, “Fast Jack” Beckman drove his Infinite Hero Dodge Charger funny car to his second win of the season from the 14th ladder position, beating teammate Tommy Johnson Jr in the second all-Mopar funny car final round of the 2018 NHRA season. After starting the 2018 season by winning two of the first three races, the Don Schumacher Racing team has had a relatively lackluster season, but things have been looking up over the course of the past five events. After winning only two of the first 10 races of the season, DSR Dodge Charger funny cars have won five of the last seven, with Jack Beckman taking home his first win at Brainerd and his second win of the season while beating Tommy Johnson Jr in the second Charger-versus-Charger final round of the year. 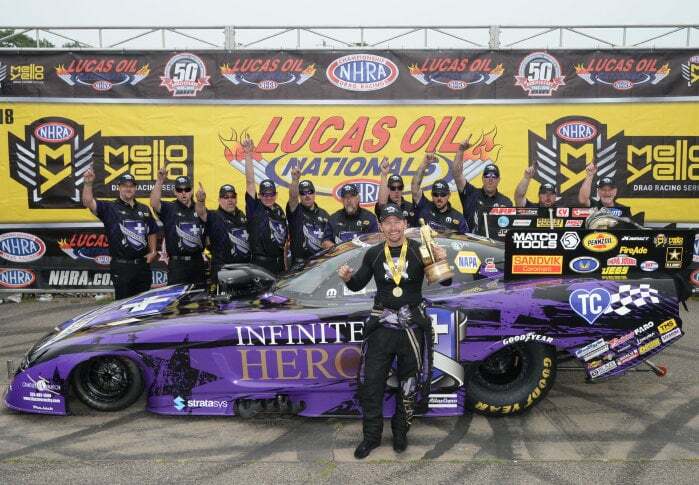 As an interesting fact, Jack Beckman’s first win of the season came in the first all-Dodge finals, with Fast Jack beating teammate Matt Hagan in the third race of the season. The Don Schumacher Racing Dodge Charger funny cars hit the track hard and fast, with Capps, Johnson and Beckman grabbing the third, fourth and fifth spots in the first round, but Robert Hight and his John Force Racing Camaro turned in the best time in the first round, running a 3.971 at 326 miles per hour. Matt Hagan struggled on his first run, laying down a 4.797 at 169 miles per hour, putting him in the 13th spot after the first run. In the second round of qualifying, Matt Hagan ran a 3.990 to jump into the second spot and Johnson turned in a quicker time to hold onto the fifth spot, but Capps and Beckman both dropped. They both continued to drop in the third round, but Capps jumped up to the second spot in the final round of qualifying while Beckman was forced to settle for a 14th-place starting position. After Ron Capps and Matt Hagan were the best DSR cars in qualifying, they both lost in the first round of eliminations. Capps lost to Jonnie Lindberg while Hagan lost to Jack Beckman. Tommy Johnson Jr beat Del Worsham, so two of the four DSR Dodge Charger funny cars made it out of the first round. At the same time, Robert Hight and Courtney Force both won in the first round while John Force lost to Tim Wilkerson. In the second round, top qualifier Robert Hight lost to J.R. Todd and Courtney Force beat Lindberg while Beckman beat Shawn Langdon and Johnson beat Tim Wilkerson. This set up a Dodge-Toyota battle in one half of the semifinals and a Dodge-Chevy battle on the other side of the bracket. In the Dodge-Toyota race, Tommy Johnson Jr pulled the hole shot on J.R. Todd and ran the better time to advance to the finals. In the Dodge-Chevy race, Beckman beat Force at the line and got to the finish line faster, securing the second all-Mopar funny car finals of the 2018 season. In the finals, Jack Beckman grabbed a huge starting line advantage (.027 to .068) and he was still pulling away on the top end, running the quicker ET and the higher trap speed to take the win. With one event left before the Countdown to the Championship, Courtney Force continues to hold the lead in the title race, leading Ron Capps by 195 points. Robert Hight is third (-218), Jack Beckman is fourth (-262), Matt Hagan is fifth (-270) and Tommy Johnson Jr is sixth (-385). John Force is in eighth (-517), so all four of the Don Schumacher Racing drivers and all three of the John Force Racing drivers are going to be included in the shootout for the championship title. The other three drivers in the top ten who are on track to make it into the championship round are Toyota drivers J.R. Todd and Shawn Langdon in seventh and ninth, along with Mustang driver Tim Wilkerson in tenth. Who cares. Drag racing is dumb.